I can't recall how many times I have actually gone bass fishing in December. 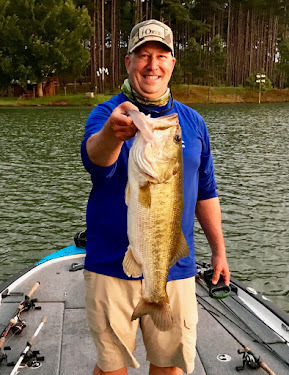 But I mentioned to my good friend, Steve Renfroe, that I was NEEDING to get away and throw a line... and he provided the opportunity. We left after exams on Wednesday, Dec. 18. Steve had a large group up at the baseball cage watching MLB player Wes Helms crushing the baseball. We jumped in the truck and headed about an hour southeast to an undisclosed part of Coosa County. The lake was beautiful- the clear blue sky and bright sun had warmed us up to just over 50F and I knew it would be a pleasant day whether I caught anything or not. It is always so quiet during the winter- but it only added to the peace of the afternoon. After only 5 minutes of just standing and staring, I was feeling the health that God's pristine creation always provides. We launched the boat and drifted through all kinds of good fish cover- past the faithful feeders that feed the fish that end up being the delicacies of the trophies we hoped to land. This particular lake is managed by Southeastern Pond Management Company and from all external evidence was healthy and excellent. I always start with plastic- it is just my comfortable base. It helps me feel out the lake- depth, cover, and I feel the temp of the lure to get a sense of how slow I need to go. The water was cold. And there wasn't any activity visible to my eye. But even then, I loved throwing and working my red ribbon- tailed Texas rig on the end of a faithful old Ambassador reel and sturdy rod. About 45 minutes in I finally got a tap, likely a bream, but was a thrill to finally have some life on the other end of the line. Two casts later, I finally pulled one in. Very cold and very small 1 lb bass, who was never going to return because of the harvest rules of the management. It was almost 20 minutes later that I began to experiment with some other presentations. I tried a lizard, but didn't like the dark blue color for those conditions (no clue if the bass care about the color- it has always been what I feel good about). I like the chartreuse firetail on the end of Steve's lizard and he had gotten some action on it. So I pulled out a light green fluke and put it on my Texas rig.... but it was too heavy. I wanted something to hang in a slow suspended area near cover. I then rigged it totally weightless, but it was too light and really never got out of eyesight. I then put a small slip shot weight about 4-6 inches up the line from the hook and liked what I got from that. Enough to work it with different tugs and twitches, and let it fall and drift. I wacky hooked it for a few throws, but thought the action was too fast for the temp. I then regular hooked it and let it swim and drop. My first cast like that got a strike. It was like the others we were getting... just a small tap, and not much after that..... I set the hook, but missed. I have to credit my friend Jody Rogers for a lifelong habit I have done after a miss. I don't cast right back at it. I will go away for 1 cast and then come back. So I turned form the close bank and cast just past a stickup about 10 yards behind me. I twitched the fluke with a little flip right at the stick up and watched it drift down.... and that is where she picked it up. It was a good tug and felt heavy on my hook set. It was a big fish and I began to work it in. Steve got real excited... "Big fish" and I said "I don't think it is that big" but then I saw her turn sideways and OH BOY... it was no ordinary big fish. We pulled out the net and for a second I had net and rod. I almost lost her as she took one more dive and tried to get under the boat, but I eased her back to the top and we netted her in. I have had a 10 lb dumb bell in my hands before... but this felt heavier. The stats revealed what a whopper catch this was...... 12.5 lbs/ 29"long/ and a girth of 19"- fat full of shad. Steve caught a few more on a crankbait in the same area- all of his fish that day were nice. But I had done the fishing version of a hole in one..... that lucky shot that rolls in for a rank amateur that makes him smile for a while and tell everyone about what he has done- but on the inside you know that it will likely never happen again. It was also a huge make-up for all the times the big one has snapped my line or slung the hook back at me- all the former anguish was now joy! We ended the day filling up the feeders and I got to shoot his pistol for a few rounds.